1 bottle treats up to 5,000 gal./18,921 liters, 1 pump treats 100 gal/378 liters. 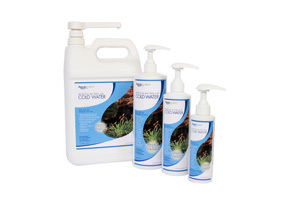 Aquascape Cold Water Beneficial Bacteria contains 7 pure strains of concentrated beneficial bacteria that go to work quickly cleaning and balancing your ornamental pond, works at temperatures below 50F or 10C. Because ornamental water gardens are enclosed ecosystems, sometimes factors like fish load, uneaten fish food, organics such as leaves, sludge and unwanted debris may disrupt the balance. Aquascape Cold Water Beneficial Bacteria contains a specific combination of bacteria that are most effective at doing two jobs- reducing organic material such as leaves and pond sludge and reducing ammonia, nitrite and excess nutrient such as phosphate that are known to cause poor water quality and unsightly water conditions. 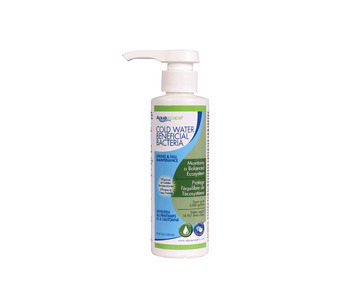 Available in four sizes: 250ml/8.5 oz, 500ml/16.9 oz, 1 liter/33.8 oz,4 liters/1 gal. 1 bottle: treats up to 5,000 gal./18,921 liters 1 pump: treats up to 100 gal./378 liters Unit Weight: .6 lbs.